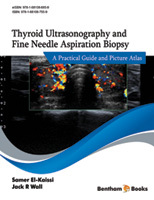 Thyroid ultrasound has become an essential tool for the diagnosis of various thyroid disorders. It can be performed in the office during a medical consultation and is used to guide fine needle aspiration biopsies of the thyroid and cervical lymph nodes. Thyroid ultrasound waves are produced by piezoelectric crystals in response to electrical stimulation. These crystals also detect reflected incoming waves and produce a voltage that is used to construct an image. Beginning with A-mode imaging, thyroid ultrasound has evolved into inexpensive machines that produce high resolution twodimensional B-images. Important properties of thyroid ultrasound waves that affect image quality and resolution include wavelength, propagation velocity, frequency, and acoustic impedance. Posterior shadowing, enhancement, and reverberation are common artefacts of neck ultrasonography and can be useful in defining certain features on ultrasound, such as posterior enhancement of cystic structures and the identification of colloid crystals in thyroid nodules due to reverberation. Colour Doppler and power Doppler help differentiate vascular structures in the neck, where power Doppler is more useful for smaller vessels.